Looking for something unique? 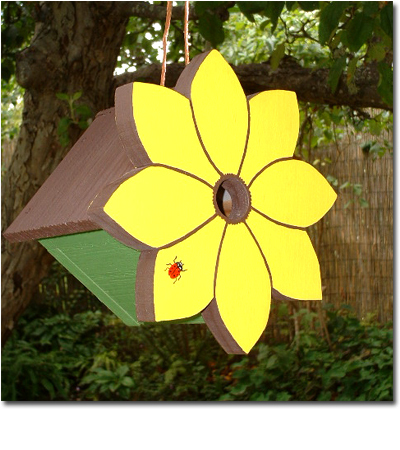 A birdhouse that matches your home, or perhaps a one-of-a-kind gift for someone special? 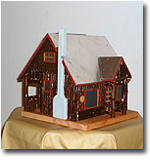 We can build a custom design for you, creating a replica of your home, barn or local landmark, even down to matching the paint colors. Contact us with your request. Open wide! 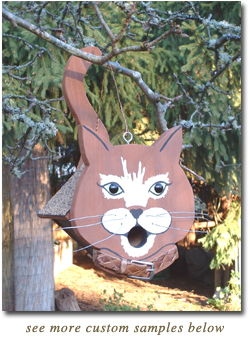 The whimsical chickadee-wren house to the right was created as a special donation for a fundraiser, and featured wire whiskers, button eyes and an old belt for the collar. More examples of our unique designs for clients can be found below. 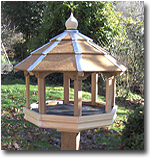 See the beautiful designs of our temple and rustic birdhouses that make charming focal points for any garden. 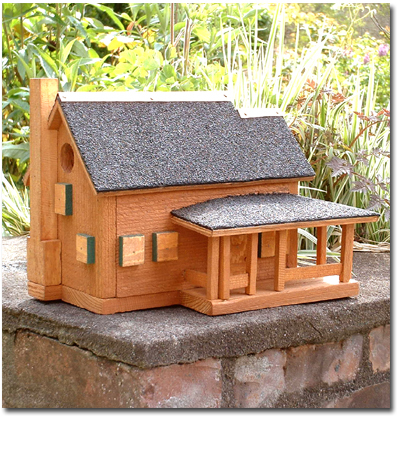 Explore our selection of small lid and privy birdhouses. Our new selection of bird feeders is here! 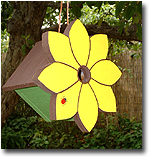 Sandy was a talented artist who died young, and after her two grandsons were born, a family member commissioned several birdhouses in her memory, with the front panel designs to be based on her artwork. 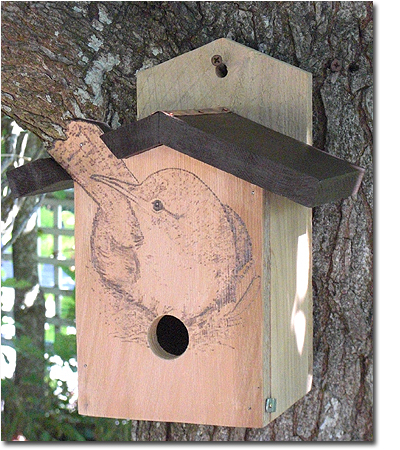 For this wren house, Carol used a wood-burning tool to re-create Sandy's original pastel drawing of a wren. The houses (the other depicts a Western screech owl) now hang in the family's gardens, serving as reminders of Sandy, her artistic talent and her love of nature. And now for something completely different! 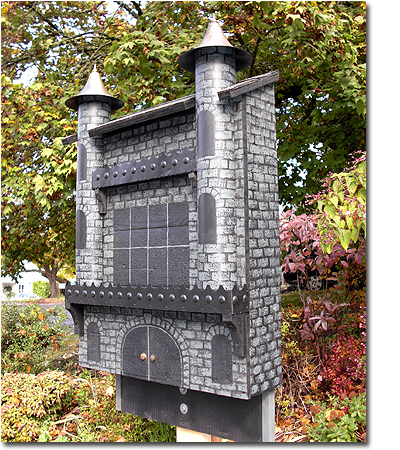 This fantastic structure is a completely functional, three-chambered bat house. 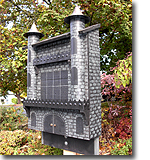 The customer approached Carol with a request for a large bat house to serve as a focal point for her new fruit and vegetable garden, but she wanted something more distinctive than the utilitarian houses that are available. She asked for something "creepy" and this haunted castle fa?ade certainly fits the bill. The house is built to specifications recommended by Bat Conservation International, and is large enough that a bat colony may raise their young in it. Recycled or salvaged parts used include exterior plywood, light fixture parts, plastic pipe, asphalt shingles and mesh screen. It's now mounted high on a post in the owners' garden, ready for tenants. For this project, Carol was approached by a local couple who wanted a replica of their custom-designed home. She was able to recreate it to scale, including the porch and chimney, using recycled cedar and asphalt roofing. The birdhouse's window trim color matches the home's trim. 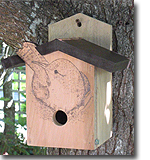 By partitioning off the nesting area to the correct dimensions, this birdhouse has had chickadee tenants every year since the owners placed it outside. 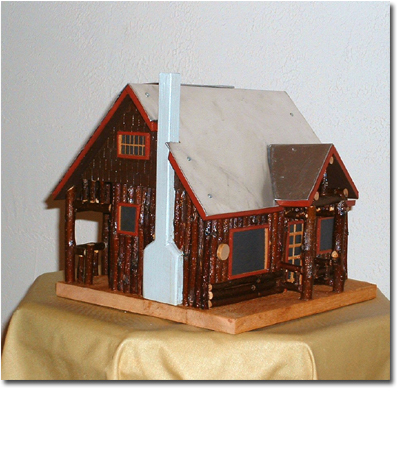 This cedar house replicates the log house that Log House Plants, a wholesale nursery in Cottage Grove, Oregon, is named for. The house is covered with handmade cedar shingles and twigs pruned from Carol's 65-year old apple tree. It has a metal roof like the original house and was commissioned by the Log House Plants owners, who also provided the paint to match that which was used on the actual structure. 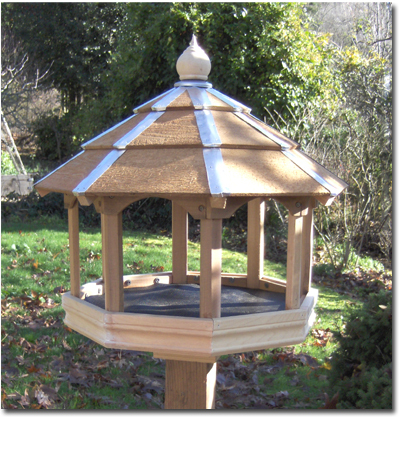 This custom gazebo feeder was designed for an Oregon couple to replace an aging feeder they'd had for years. They also wanted a larger structure and one with better drainage to reduce the amount of sprouting/rotting birdseed, which can be a problem in the rainy Oregon winter. The solution was a base with open areas between the supports, with the entire floor covered by a heavy-duty, UV-resistant plastic mesh (recycled, of course). The owners have mounted the new feeder on a 4x4 post next to their elevated deck, and report that they and the birds love it! 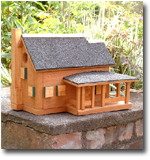 A dear friend of Carol's commissioned this chickadee house for her grandchild. It features handpainted ladybugs on the front and rear.